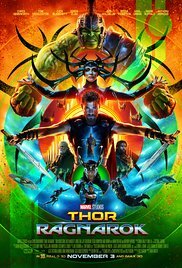 Thor 3, AKA Ragnarok, was incredibly engaging and hard to tear my eyes from. It’s now in my top tier of MCU movies, beaten only by the first Guardians of the Galaxy. [pullquote position=”right”]Hemsworth’s slightly dim but mighty character is a joy, from his 4th wall-breaking open, to the mid-credit end, and the man’s got surprisingly perfect comedic timing. [/pullquote]Who knew? Turns out Hemsworth really can carry a movie on his muscular back, with more than raw beauty to show for it. I wasn’t expecting too much going in, but admittedly the bar was so low with Thor 1 and 2 (especially 2). The director used Thor wisely in his 3rd, and presumably final, solo film. Although it’s essentially a buddy movie about Hulk, too. Just like Captain America 3: Civil War is basically an Avengers ensemble movie, right? It works. What’s unusual about this film are the villains. They aren’t bland meanies, like most superhero supervillans; they’re actually okay. Damning with faint praise, I know. Cate Blanchett does a decent job with what she’s given (I sense there were more scenes left on the editing floor). The Ragnarok fire demon was fine – he wasn’t intended to be more than a burning lava monster, from cold open to the unusual climax. And Golblum isn’t even a “bad” guy — he’s just an amiable meglomaniac with a harem and God Complex. He reminded me of The Collector. I hope we see them both again. I do feel bad for Hela…there could have been a lot more depth to her arc. I guess she needed to get in line for scene time after Loki and Odin and Heimdall (who, thankfully, had something to do this time around). I’d be super happy with a Heimdall movie, for reals. The man was wasted, although the teaser suggests more to come. Saying anything more would enter spoiler territory, so let’s just move along. But, we’re still talking about Thor here, and Thor 3 manages to pull a win from their previously low Marvel tier buttocks. And yes, I rank Marvel movies by tier: Great, Good, Okay, and Fetid…and Thor’s been scraping the bottom in his stand-alones, til now. I credit the director — who also played the delightful Rockman — for understanding what Thor should be used for, along with Hemsworth for embracing his slightly slow but funny godhood (“Because that is what heroes do!”), Ruffalo for being freaking awesome in his dual roles, and for the writers giving us something happy in these dark times…YES. Thank you for the color, the fun, and for Goldblum. He’s the perfect weirdo to be the Grandmaster, and I hear he smartly improvised most of his lines, playing himself, as usual. Go Goldblum, go. And now I’ve got The Immigrant Song, by Led Zepplin, stuck in m head. It’s a good choice, so that’s okay by me. The reprise was certainly welcome, and the audience clapped at it. I was a happy movie goer that day, and saw it this three more times in the cinema later. Watch it in the theater, and watch it again on DVD.